The Philippine Software Industry Association (PSIA) records that the country's bustling software sector has generated US$1.16 billion in export revenue in 2012, a strong 17% leap from the previous year. More Filipinos have directly benefitted from the growth of company revenues in the form of available jobs in the market. The number of full-time employees (FTE) rose 14% totaling to some 57,000 in 2012. Estimated revenue per Full Time Employee (FTE) per annum approximates to $20,500, a 2.2% positive nudge from 2011. PSIA President Nora K. Terrado remarked that the software and IT outsourcing sector is right on its targeted growth trajectory. The industry is closer to reaching $1.5 billion in export revenues by 2014. Terrado also added that while the country's lively economy is an effective catalyst for growth, there are still many things to take care of in order to further expand it. Terrado reiterated the importance of the Filipino workforce in sustaining the growth of the sector and pinpointed the development of the Filipino talent as the top priority of the PSIA. "Moreover, it is also important to develop and grow our key markets. Our approach includes greater focus on in target markets where the chances of building demand and winning the deals for PSIA members are high. In line with this, the PSIA is leading the IT delegation in two international trade missions to promote the global competitiveness of Filipino software and IT companies this year. One of them was the recently concluded Software Development Expo in Tokyo held last May 8-10, tapping the promising Japanese software market. Another target is the CeBIT in Sydney, Australia on May 28-29. 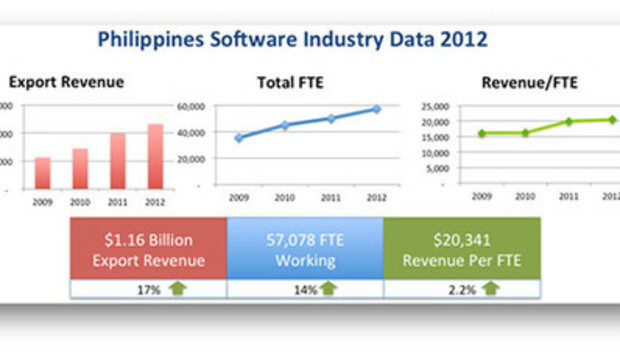 The Philippine Software Industry Association is a non-stock, non-profit organization of more than 150 member companies. Founded in 1988, PSIA is celebrating its 25th Anniversary in June.